High Wycombe, UK, 6 September 2017: At Paris Retail Week 2017 (19-21 September, Paris Expo, Porte de Versailles), Star Micronics (Stand NO56) will be demonstrating the future of POS connectivity with pioneering solutions for traditional and tablet POS from a number of its retail software partners including Tactill, RoverCash (LundiMatin) and Qudini. 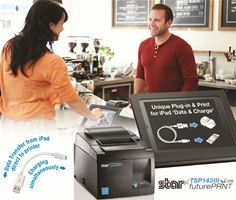 Star offers a range of flexible solutions that can easily be upgraded as your POS system evolves. From complex retail store systems to a simple pop-up set-up, Star has the expertise and wealth of experience to provide a tailored cost-effective solution. Leading the field in traditional and tablet POS with the very latest Cloud Bluetooth and wireless counter-top and mobile printing solutions for tablet POS applications, Star’s customers in France include France Billet, Ticketmaster, CGR Cinémas and PPMC. For retailers looking for a high performance counter-top printer the latest addition to the renowned TSP100 futurePRNT™ series is the unique TSP143IIIU – the only receipt printer solution today to communicate and charge simultaneously and directly with an iPad or iPhone, removing the insecurity of wireless connection to provide a solution that seamlessly combines the flexibility and cost savings of tablet POS with the reliability of traditional POS. Managing a large estate of multiple tablets and paired Bluetooth devices means that it can be operationally difficult to maintain the right connection between the right peripherals and devices. The TSP143IIIU changes all this. As well as working with a traditional POS terminal, this printer can connect directly to an iPad or iPhone using the Apple supplied lightning cable for reliable USB communication as opposed to previous iOS wireless only technologies. As a result, the usual Bluetooth or WiFi / wired LAN set-up issues around pairing, network infrastructure, connectivity etc. are eliminated from a hardware perspective. No other stand-alone POS printer can achieve this. Furthermore, this is a cost-effective solution given that a USB printer is cheaper to purchase than a Bluetooth or WiFi version. Star’s success with the undoubtedly large number of ISVs has been achieved via its attention to detail regarding SDKs and documentation enabling easy integration. Star’s experience is that many software solutions already work with the TSP143IIIU whilst others can easily integrate with the new SDK, knowing that it covers all products in the renowned TSP100 range. The TSP100 Series will remain the principal tablet POS printer series of choice due to its vast connectivity models including Bluetooth and WLAN, while the TSP143IIIU in particular is the only USB printer on the market today that can communicate directly with Apple devices. Demonstrating Star’s focus on connectivity, retailers can today purchase a Star TSP654II with a traditional interface in the knowledge that it is future-proofed for whatever cloud strategy the retailer wants to adopt and provides an easy, affordable upgrade by simply replacing the traditional interface with the HI X interface. The interface can also be used with other Star printer models that offer 80/112mm label, ticket and receipt printing – TSP743II and TSP847II as well as SP700 matrix printer. Alternatively, the TSP654II HI X Connect receipt printer is ready for the Cloud with the interface built in. Both solutions offer intelligent printing for modern Cloud retail, logistics and hospitality applications. For retailers looking for a cost-effective all-in-one tablet POS solution, mPOP™ is a unique combined Bluetooth printer and cash drawer mobile point of purchase station that is low cost and lightweight at just 10cm high and 30cm wide with a sleek design. With the POPPack option that includes a high quality black or white tablet stand (alternative colours are available if required) and metal plate, users can successfully create a stylish mPOS station. The POPPack design provides a flexible option with the extra security required within a busy retail environment, whilst retaining the mobile element. This provides the ability to securely store or transport the mPOS station at the end of trading.